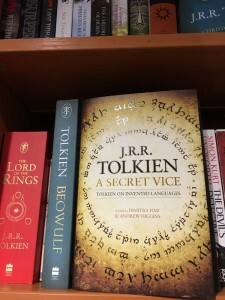 As promised in yesterday’s blog post, I have tried to put together some extracts from the first reviews of A Secret Vice: Tolkien and Invented Languages, mainly so that I don’t forget the thrill of reading them and so that I keep on remembering that the book is now done, out there, and read by Tolkien scholars and enthusiasts all over the world. 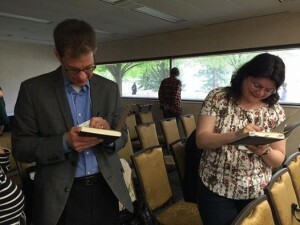 Since its publication, I have seen the book in the hands of friends and strangers and I have had the pleasure of signing copies, including at the International Medieval Congress at Kalamazoo, Michigan, in May. The reviews below are from the press and online reviewing platforms. I am awaiting eagerly the first reviews in academic journals and periodicals. 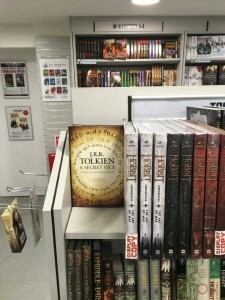 [Tolkien’s] talk is a vigorous defence of the [language invention] “hobby” and, with the support of the background commentaries provided by Dimitra Fimi and Andrew Higgins, it becomes clear that the invention of languages has been a surprisingly widespread activity. A Secret Vice is a thoroughly engaging introduction for the outsider. […] This edition includes not only the 1931 paper but also the various notes that Tolkien made in preparing it. It’s a mishmash, with something for the Elvish buff and something for those who enjoy unlikely cultural collisions. A good example of the latter is a note by Tolkien on the “Anna Livia Plurabelle” section of Joyce’s Finnegans Wake. This is a fascinating and very well written account of the history and development of Tolkien’s invented languages. It has the virtues of the old scholars: clarity, sharp focus, detail, careful examination and analysis of the evidence, and an absence of the clogging jargon that has become a disfigurement of academic writing and often a substitute for thought and insight. […] The range of knowledge revealed here is extraordinary, yet it is lightly worn and is subordinated to underpinning the conclusions which the two authors reach. […] The text proper of ‘A Secret Vice’ is given in a form that is a model of its kind, a very clear text that preserves cancellations and changes found in the original typescripts and manuscripts held in the Bodleian Library in Oxford. The editors have appended succinct and most helpful notes that explain or expand complexities in Tolkien’s argument. […] This is an unfailingly fascinating, thorough and comprehensive account of a largely technical subject that is central to an understanding of Tolkien and his work. It would be very surprising if it did not remain the standard text on this subject. This book contains a lecture on invented languages [Tolkien] delivered to the Samuel Johnson Society of Pembroke College at Oxford University in 1931 as well as related material and essays, all ably edited and annotated by the notable scholars Dr. Dimitra Fimi and Dr. Andrew Higgins. […] After the introduction we have the essay itself, with Tolkien’s own crossings out and emendations, accompanied by Fimi and Higgins’ wonderfully detailed Notes. 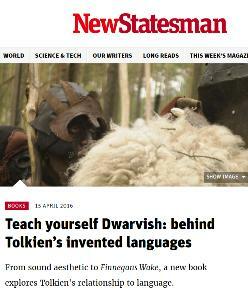 Next is Tolkien’s related essay on “Phonetic Symbolism,” which contains many of the same themes, though with some differences in emphasis and detail. This is also meticulously annotated by Fimi and Higgins. The third segment discusses manuscripts and notes pertaining to the essays which are held in the Bodleian, and a Coda details the ongoing interest in invented languages which Tolkien helped inspire. […] This is a marvelous work which adds much to Tolkien scholarship. As a huge Tolkien fan and as a linguist I highly appreciate the efforts the editors made, in order to show us the creative process of the two essays that are annotated in this book. […] The editors Fimi and Higgins are to be commended for their highly interesting attempts at tracing the origins of certain phrases and terms. […] It is worth a philological and careful read by those who have an interest in Tolkienian languages, sound symbolism and those who wish to read an interesting book. Let’s just face the facts people, Tolkien was a genius. He was the inventor of languages and mythology; he was the designer of races and cultures: he was the creator of worlds. He created modern fantasy. So here’s a book that gets right down to the nitty-gritty of Tolkien’s wonderful world; it explains the logic, and the success, behind his imagination: the language itself. Tolkien’s essay “A Secret Vice” is replicated in here. Certainly, the essay is available, along with many others, in editions that collect his writings. You may even be able to find it for free online. That’s great, but this edition goes into a great deal of detail. The scholarship of the editors is of the highest quality. The introduction, notes and explanatory sections are extensive and illuminating. In all honesty, I don’t think I would have appreciated the full importance of Tolkien’s arguments without the extensive efforts the editors have gone to. This really is good stuff. Last but not least, for a Storify story about how the book has fared in blogs and social media see here.